Nelissen Bricks introduces the N70, a new and exclusive format of facade bricks. With its length of 24cm and depth of 7cm, the N70 is longer and slimmer than a traditional size brick. And that counts! Nelissen proudly presents the N70: a new and exclusive size of facing brick: ±240x70x50 mm and ±240x70x40 mm. Discover how only 3 cm can make a huge difference. 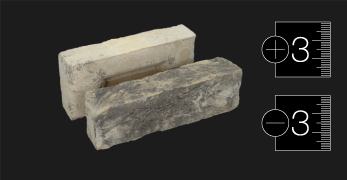 N70 is not only 3 cm less thick, but it's also 3 cm longer, comparing to any traditional brick. With N70, your external walls are thinner, which creates some extra living space or allows to increase the insulation for 3 cm, at your choice! This brick is lighter and easier to bring to the site. It also implies less energy costs for transportation, which makes it truly ecologic. The N70 with its narrow shape asks for specific brickwork bonds that are not based on the modular ratio header/stretcher. The irregular bond and quarter brick bonds are ideal for the N70, but the Dutch bond is also suitable. Thin joint masonry ± 6mm (thin bed) or ± 4 mm (glued look) lend themselves particularly to this type of stone with a width of 70mm. Aside from it's technical specifications, N70 is also very eye-catching. The extra 3 cm in length give it a very special look. Thanks to it's unique length and thickness, N70 is especially fit for glueing to create the façade of your dreams.